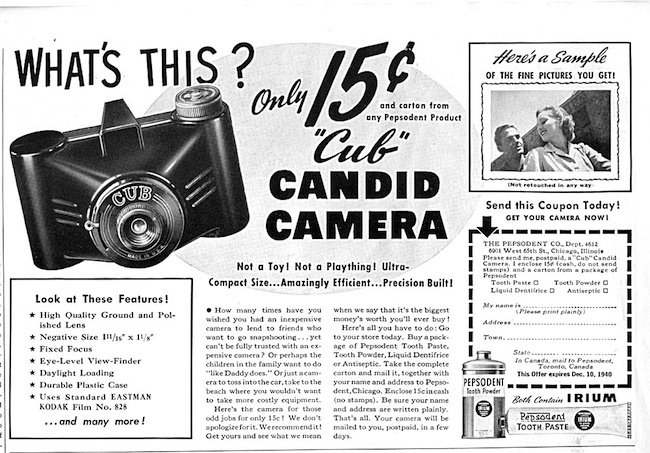 The Cub camera was manufactured and marketed by the American Advertising & Research Group of Chicago, Illinois in circa 1940. It was a very inexpensive miniature candid type camera that was typically given away as a promotion. the Pepsodent tooth paste company advertised the camera for only 15 cents if accompanied with a carton from any pepsodent product. The camera was constructed of plastic with a built-in eye level view finder. It featured with a high quality ground and polished fixed focus lens and a snap shot shutter. The camera was capable of capturing exposures 1 11/16 x 1 1/8 inches in size on standard no. 828 Eastman Kodak Roll film.